General Parking: Parking is metered on the city streets and handicapped spaces are not designated, but individuals with vehicles displaying a handicapped placard or license plate may park in any space, free of charge. Street metered parking in downtown Riverside on Main Street currently costs 25 cents per 10 minutes, up to four max at a time. Parking structure are located at 3535 12th Street, 4090 Lemon Street or 3964 Orange Street. 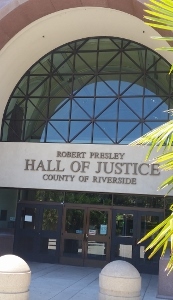 Below is the Google Map to the Riverside Hall of Justice.